QUAKETIPS: At last, helpful hints on installing push-latches for cabinets! UPDATE BULLETIN AUGUST 3, 2018: There has been discussion for several years about whether earthquakes can cause doors to shake enough to open up these push latches. Despite a range of evidence that push latches work well in earthquakes, I have seen earthquake simulations that were able to jiggle cabinet doors and cause push latches to disengage. However, I still like the push latches and feel that they still considerably reduce the chances that the door will open under most circumstances. I have written a new article that discusses this and describes an alternative latch, and I encourage readers to check that out also. If there was a moderately sized earthquake and your kitchen cabinet doors swung open, what would happen next? Well, anything in those cabinets could (and frequently does) fall out: breakable bottles of various things, dishes, glasses, and even heavy appliances like blenders. Look in your cabinets and imagine the mess, loss, and potentially even injuries suffered by small children and pets who might get hit by falling objects. Even if nobody is hurt, if none of the humans are home but a dog or cat is there unattended, there’s now a bunch of sharp or potentially toxic things all over the floor for the pet to lick and eat before you get home. Clearly, it’s better just to prevent the doors from opening in the first place with quake-resistant latches. The problem is that many people are lulled into optimism by a variety of pinch-style latches, magnetic latches, etc., that can make the cabinet door tough to open without some effort. Some cabinet doors are harder to open than others; but you know that if you pull hard enough on the outside, they will open. Guess what: that means that if the items inside the cabinets are pushing hard enough on them, they will open. In some cases, the vibration itself can make the doors swing open and then everything can fall out. Some people install the child safety latches that allow the door to open an inch and you have to slide your fingers behind it to move a lever before the door can be fully opened, but because this can be really inconvenient, I have installed push latches on my cabinet doors. That is, the door can’t be opened by pulling on it; you have to push first and the latch disengages, and then when you close it, you push again and it re-engages. While it’s theoretically possible that vibration in just the right direction might make the door push itself and open, I think it’s unlikely. I feel that the latches are pretty important, but they are a bit of a pain to install and they take some trial and error. That’s where this blog comes in; I try to save people from having to go through the same learning process that I went through, so here I’ll be giving you some hints on installation; things I’ve learned in the several times that I have installed these latches. There are a few different kinds of push latches (touch latches) out there, some of which are not very good. All of my personal experience over many years has been with one type (shown here) and I’ll focus on that one for this article. The two videos embedded after this paragraph show how they work. I occasionally see them in hardware stores but not very often, and these days, I just go straight to the Internet. The two sites at which I have found them are Sunset Enterprises* and Woodworker’s Hardware. The prices vary slightly; and at the time of this writing, the latter site actually has a better selection of colors and also a low-profile version that I have not tried yet. [*Update comment on 4/28/14: this Sunset Enterprises site no longer works and a current site for the company makes it difficult to look up products, so I've deactivated the link.] These can be a bit tricky to install, because unlike normal latches that can keep the door closed to the maximum extent, the push latches only work if the door can be pushed in slightly farther than the "closed" position to disengage the latch. In fact, if you accidentally install them without enough extra pushing space, then you close the door and never open it again! (That happened to me once, on a single cabinet door, so there was no way to access the latch; I had to pry the darned thing open and it was really hard to do! That reassured me that the doors will not easily open if objects inside the cabinet are trying to push their way out.) For this reason, if you have double and single cabinet doors like most kitchens do, I recommend that you do the double doors first just in case you have beginner’s unluck. The best way to become familiar with how this should look is by starting with one door of a double door, with the other one open so you can see inside. Have a pencil, some tool with a sharp point or nail to make starter holes, double-stick tape, an appropriate screwdriver, and an electric drill (optional but useful). Engage the peg in the claw to make one unit, put the whole thing into roughly the desired position, and hold it down to the shelf with one hand tightly so that it can’t slide (as shown in the photo at the left). With the other hand, close the door and experiment a few times to see where the latch needs to be to make it disengage and re-engage with the door is pushed a few times. Find the spot at which there’s the minimum space necessary to allow the latch to disengage. Don't let the claw part move. You’ll see that the main body of the claw part is probably sticking out slightly over the shelf, but as you can see in the group of three photos (below) from different cabinets in my kitchen, sometimes the optimal position is even with the edge, and sometimes it’s recessed a bit. It depends on how that particular cabinet is put together and how far away the edge of the shelf is from the inside of the cabinet door. The instructions assume that all cabinets are built the same; don’t make this assumption! At this point, I’m always tempted to use my power screwdriver, but I rarely can because I find it usually does not fit due to the hole being so close to the main body of the latch. Just be ready to use a manual screwdriver and some effort. You are probably wondering what to do with the single doors. You’re right; unless you knock out a wall of the cabinet or enlist the services of a small elf, you can’t really test the latch in the way I just described for the double doors. In this case, you can put the latch (in one unit as before) loosely on the shelf where you will mount it, but sticking out too far; and then slowly and gently close the door all the way and open it again. The complete latch should get pushed back by the door to about the right place, but too far because there's no extra room to push. Move it ever so slightly forward, about 3 mm, to give yourself some push room, hold it down firmly without moving it but make sure that it is straight, trace the holes, and proceed as above. Either way, now that your claw is in place, put some double-stick tape on the back of the peg and close the door. Push again to open the door and the peg should be stuck to the door in the correct position. Take your sharp point and press through the hole, through the tape, to make a puncture mark that will still be there when you remove the peg and tape. Then you can drill it (DEFINITELY don’t drill through to the other side) and attach the peg with its screws. Try it out and see if it works well. The first time you do this, you might have to reposition a bit. The newer versions of these latches have pegs that actually are free to float a little within the part that holds them to the door (compare the two types of pegs in this photo and also look at the first picture in this article), which means that there’s a little extra fudge factor if you didn’t do it perfectly, but it’s still best to strive for perfection. This floating peg actually makes it harder to position, so when putting on the double-stick tape, try to position the floating part dead center in its window. Some of these latches are now being shipped with a little bit of quake putty that you can use to stick the peg to the door while positioning. This is meant to be left in place during the installation. I can’t imagine why anyone would want to do that; you can see the putty when you open the door and it holds the peg farther out from the door, leading to larger gaps and more tenting effect. The double-stick tape works just fine; keep the quake putty for use elsewhere as...quake putty! (One of these days, I will write an article about the hundreds of other things you can do with quake putty.) A little tenting is unavoidable, as you can see in the upper photo at the right, taken from below the cabinet looking upward, but from the front as shown in the lower photo, it’s not that bad. In one cabinet, there was no room for the latches on the bottom shelf due to a large spice rack, so I needed to put them on a middle shelf, which was too shallow to reach the inside of the closed door. That meant that the latches had to stick out into thin air to reach the door. Here, the quake putty really came in handy; as you can see from the photo taken from below that shelf, I used the two rear screws and then wadded up as much quake putty as could fit into the fortuitously placed crevices in the underside of the latch. Between the two rear screws and the quake putty, those latches are actually quite firmly stuck to the shelf (see photo at right, taken from below the shelf). This would have been really difficult to do with a single door; being able to hold the latch in place while positioning was crucial. If you attach them to a middle shelf that isn’t attached to the cabinet, make sure that it can’t easily slide forward because then you haven’t really latched the door to anything solid. One thing they don’t warn you is that if the door is narrow enough, and closes with a tight arc, the peg will move into the claw with a strong curve and the mechanism might not work. One solution is to mount the claw sideways on the wall of the cabinet rather than on the shelf; as shown in these photos from my desk cabinet door. On the other hand, look at this funky kitchen cabinet that houses the duct for the over-stove fan vent. There’s no place to put the latch at the edge of the cabinet, and putting it in the middle by that blender didn’t work; and doing a side mount just wasn’t practical. The blender is heavy; I didn’t want that falling out. My solution was to forgo the push-latch altogether and install a catch on the front of the doors; effective, but less convenient and certainly not pretty. A sliding bolt would have worked as well. For pairs of doors that are hardly ever opened, you could even put a heavy rubber band between the handles, although that doesn’t look very refined. My last example is from an apartment in which we were renting, which had two problems; the difficulty in putting holes in the woodwork of a rental, and the fact that the shelf was slightly lower than the edge of the cabinet (as in the photo). I had installed these things in cabinets in a previous apartment without much thought because the cabinets were archaic and full of holes already, but this was a brand new apartment, never used. My solution, as shown in the photo, was to use plenty of quake putty (love that stuff) under a piece of plywood that brought up the level of the shelf to match the edge. Then, to avoid holes, I used 3M Command strips (the adhesive strips that release when you pull the tab) to attach the latch to the plywood. For the pegs, well, I admit that I put some holes in the inside of the door, but in my defense, there were actually starter holes in the right place already as if they had been made to accommodate a latch of some sort...and I filled those tiny holes with wood putty before moving out. The challenge faced by renters in making effective quake preparations in their apartments is a whole topic itself, which I will tackle in a future article. By the way, I suggest that you do NOT use the “shocklock,” which is supposed to have a piece fall into place when the shaking starts to prevent the door from opening. I got one of these things and tried my hardest to make it work by shaking violently; the piece fell occasionally and only after many seconds of shaking, and only if the shaking was in the right direction. I think it has been discontinued. There are better versions of this for industrial lab cabinets that look pretty good from what I can tell (I’ll explore them in the future), but they are too big to be practical in a home kitchen cabinet. Here’s one more issue to consider, do you remove the handles from the cabinet doors? Handles are meant to be pulled, and YOU know that you should push the door first, but any helpful guest will automatically pull the doors open, and either they are in for a shock, or they will keep trying until they break something. In the old apartment with archaic cabinets, I removed the handles (I kept them for when I moved out) and temporarily filled the holes with a waxy wood filler that matched the color of the cabinets. That can work, somewhat imperfectly, with dark stained wood; although I think it would be pretty obvious with light wood. In our current kitchen, the handles are still on the doors and we just warn guests when they go into the kitchen. It’s a great way to trick them into an impromptu discussion about earthquake preparedness! Matt - thanks so much for this source for the push-pull cabinet latch! 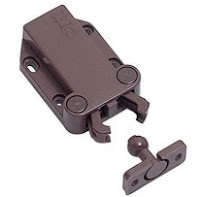 This is the very latch we have been using for years (see QuakePrepare.com), and it's no longer carried by our wholesaler. I just found out about your earthquake preparedness education work. I've been doing in-home EQ preparedness consultations for almost 8 years, and I'm so happy to know about you. Thanks Larry, and I just checked out QuakePrepare.com; good website! Readers, there's another good source of information; check it out. I just installed a couple of these, and they are easy to use. However, if I shake the doors of the cabinets just a little bit, the latch comes undone because the shaking pushes the latches in and they get released. I have a hard time imagining they would actually work very well in an earthquake, though they're better than nothing. I'm curious if you've actually seen some of these work in a sizable quake. Thanks Erin for raising this issue. I've wondered whether there's any motion generated by earthquakes that could make the cabinets open. Clearly there's one motion that's intended to do so, pushing the part near the opening end of the doors. However, since the other end is fixed in the hinge, the motion would need to be a radial motion (if I'm describing it correctly); that is, pivoting around the hinge. I suspect that if the whole cabinet is shaking, it wouldn't set up the appropriate motion to pivot around the hinge, although it's difficult to model with a real cabinet. I've been tempted to set up my own little experiment in which I have a box with a hinged door with the latch, such that I can shake the whole box from side to side. There's enough preparation required to make this possible that I haven't done it, although I wonder if anyone has, and could report the results here. I have something to add to this worthwhile topic of the possibilities that shaking could make the doors push in and then open. As I mentioned above, I think the angle and motion of the shaking would make it difficult to open the latches because the latch end and hinge end of the cabinet would be moving simultaneously, rather than having the latch end pushed in with a radial motion around the hinge. It's difficult to model this with a cabinet built into the wall. However, I have a free-standing cabinet in a hallway (strapped to a wall stud) in which I had installed these latches, with a double door and latch on each door. I just tried shaking the cabinet back and forth in the direction perpendicular to the wall, with various forces and magnitudes and frequencies. For what it's worth, these doors did not budge. That doesn't mean that someone's cabinet won't open up, if given the perfect motion for that cabinet, but it doesn't appear that the doors unlatch from general shaking in that direction. In case anyone still gets updates about this comment thread, please read my new blog post on 8/3/18 about this issue. the low profile one holds less pounds for sq inch or weight pushing against it. There's another type that a friend has on her cabinets...that I see on this same site. I wonder if you have had any feed back on them. They are metal and have a hook. A review on Amazon that said they were good but that the original manufactured one was better, which of course I'd like to get and that the one on Amazon was NOT the original one and didn't function as well. Any knowledge of this one or intuition? Thanks for this alternate suggestion. I have no experience with the type pictured at that link. I just did a search for it on other sites and (not the search was not exhaustive) I only found a photo or sketch with minimal description; and I can't figure out from the static photo how this latch actually works. There are some touch latches that don't securely hold a door closed, so it's hard to tell what this one does. The reviews currently on Amazon are good for the most part but they address how securely these hold in earthquakes. If anyone reading this has one of these latches installed and can take a short video of how the mechanism works, I'd love to see it and can report back. Of course, anyone please feel free to reply to this reply thread if they have more information. Thanks; the issue here is that while shaking that pushes the latch outward won't open it (since by definition, the latch holds against an outward motion), there's a theoretical possibility that shaking could jiggle the handle part of the door in and out, and the inward motion could be great enough to mimic the intentional push to open the latch. I can see that happening in theory, although as discussed above, I haven't been able to make that happen and there are reports from others that these latches have held door closed in quakes. Still, it's important to repeat for this and all other discussions of quake precautions, that any of these measures can reduce the chances of a problem but they can't completely guarantee against a problem. Fantastic instructions. Am about to install these in my kitchen and know this will save me a few headaches. Thanks so much! It sounds like you are referring to the low-profile version (6.6 lb) from the same manufacturer of the ones I normally use (17.6 lb). I have not experimented with these myself, so I could not guarantee. I do know from experience that the large latches are extremely hard to pull open, as I found out once with a single door cabinet in which I didn't allow enough space to push the latch and the cabinet wouldn't open (see the main article above). All I could say would be that without knowing the force being applied by heavy objects being accelerated inside the cabinet, the safest approach would be to use the larger on unless the size was a problem. I suppose that if you were only going to have relatively light things in the cabinet (like small drinking glasses), you could feel safe with the smaller latches, but using the larger ones gives you more flexibility to put other, larger things in that cabinet later on. If anyone reading this has experience with the low profile latches in an actual earthquake, please let us know how they performed! I have this latch for my tv cabinet. It use to work fine but one day I moved my tv cabinet to different location and since that day I am not able to open the door. How can I open it ? That sure sounds frustrating, especially if you can’t watch TV! It sounds likely that something happened during the furniture move. I doubt the latch itself would be damaged by jostling but if the door was moved out of alignment a bit, it could be putting stress in on the latch. Remember that the door needs to be able to close a little more than its closed position or else you can’t push it in to release it, which is why a little gap is left behind the door when installing the latches. Without seeing it, my two first guesses would be either that something has moved into the gap and is preventing the door from pushing in a far as it did before, or a change in alignment is pulling the door our subtly and not allowing it to push in as far. You might look externally for signs that the door is not as perfectly straight as before and perhaps play around with putting sideways pressure in the door to see if it lets the latch open, then fix the misalignment. This might sound like it goes without saying, but you could also try pressing in really hard and see if you get past the obstruction. And, if something actually fell into the gap like a little fragment of something or shred of something, perhaps jostling the cabinet again will dislodge it. If you can’t figure it out from the outside, then you’ll have to get in there somehow. If there are two doors with latches and one does not open but the other does, then you can go in the other door with a screwdriver and unscrew the latch on the closed side. If it’s one door, or two doors where one has to open before the other, then your options are less desirable... opening up hinges or pulling off the back of the cabinets depending on its construction. I screwed up once when I was new at this and installed a latch in a single cabinet that was part of my built-in cabinets and didn’t allow enough room for the door to push closed, and ended up with a permanently closed cabinet with no access. I actually was able to put a screwdriver behind the door and pry it open; the latch actually popped up and when I put enough pressure on it. That is not ideal, of course. Hopefully you can solve this by one of the approaches in the first paragraph! Let me know what happens; I’m curious!